According to the NAHB, the average homeowner stays in their home for 13 years. If this isn't a temporary purchase for you, satisfying your needs is important. The wants can come later. You might get lucky and find a home that meets both. If not, at least you'll have the important things that you need. You can check off the wants as your budget allows. Knowing how much home you can afford helps determine the right house for you. If you don't have the money, you can't buy the house. So those wants you listed are moot points. We like to use the 28% rule when figuring out how much home we can afford. This means 28% of your gross monthly income. Your gross monthly income is your annual income divided by 12. Let's say you make $75,000 per year. Your gross monthly income is then $6,250, and 28% of that amount is $1,750. Before you find a lender and get a loan with a payment of $1,750, though, you must figure out the taxes and insurance. These figure into your monthly loan payment. Let's say real estate taxes will cost you $400 a month and insurance will cost $100. That leaves you with $1,250 for principal and interest on a mortgage loan payment. Now you need to find a lender that will qualify you for a loan for this amount. The lender will take into consideration your credit score, income, assets, and the value of the home. Let's say you find a lender that will give you a 4% interest rate. You could then afford a $261,800 mortgage. 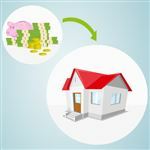 If you plan to put any money down on the home at the closing, this increases your purchase price. Let's say you'll put $20,000 down. That means you can buy a home worth $281,800. You would receive a loan for $261,800 and put $20,000 of your own money down on the home at the closing. Before you take this number and run, though, get a preapproval letter from a lender. This letter will get your foot in the door when viewing homes. It may also give you a leg up on other bidders during a bidding war. With a preapproval letter, the lender states that you are approved for a specific loan amount based on specific conditions. The fewer conditions present on the letter, the more credibility the letter provides. This often appeals to sellers. They only want to take time on interested buyers. 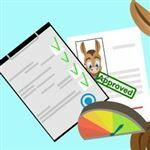 If you have a pre-approval letter, it shows that you are not only interested, but also qualified. Sellers consider this high priority when weeding through potential buyers. Don't forget about the miscellaneous costs involved in buying a home. Closing costs and moving costs are the two most common. Closing costs can be as much as 5% of your loan amount. On a $200,000 loan, you may pay $10,000. Once you close on your loan, you can move into your home. This costs money too. The average cost of a move is between $1,500 and $5,000, depending on if you hire professional movers or do it yourself. You'll need to budget for these costs as you prepare for a mortgage. Once you know what you can afford, it's time to focus on your needs. There are the obvious things you need, like a roof over your head and enough room for everyone in your family. But think outside the box. What are some things you really need? Make a checklist of the things that are non-negotiable to you. A few ideas include the location of the home, the home's accessibility, or a specific layout. There's no specific formula to determine what you need. You have to do some soul searching to figure that out. Once you have your checklist, talk with a real estate agent. As a buyer, you don't pay for a real estate agent's services. The seller covers the agent's commission. As a buyer, though, the agent can help you locate homes with the specific features that you consider a must. Having that pre-approval in hand will help you determine if you can satisfy these needs. This letter lets your agent know what you can afford. It helps limit the disappointment of finding your dream home—only to find out you cannot afford it. Using a real estate agent also helps you know what is "fair." Just because you need a home within a 15-mile radius of your place of employment doesn't mean you should overpay for it. Sometimes we let our dreams get in the way of what is fair. Let someone be the voice of reason for you as a homebuyer. Are the Features Worth the Price? In a dream world, you buy the perfect home and move right in. You don't have to make any repairs or changes. But we live in the real world, where things aren't perfect. Rather than focusing on features you can change, focus on the things you cannot change. Things you cannot change, regardless of your financial position, include the home's location, lot size, exterior structure, and layout. Make these a top priority on your home-buying checklist. Think about what means the most to you. Do you want a home with a view and few neighbors? Are you more of a city person who prefers the hustle and bustle surrounding them? Making location priority is crucial, as you cannot change your mind after you buy the home. Next, consider the type of layout you need. If this is your first home, you might not know quite yet. Think about your current living arrangements. What do you love about them? What do you dislike? This can give you an idea of what you might want. Is your family size growing or do you plan to have kids in the near future? Keep this in mind as you consider the layout. Don't just look at the interior of the home, though. Consider the exterior as well. Do you need a patio or deck? Is there a specific type of landscaping you prefer? Using a site like Zillow or Redfin, you can determine the average value for homes in the area. This can give you a good idea of a home's features and what they may be worth to you. Once you nail down your needs, it's time to look at your wants. Now is when it gets tough. You have to weed through your wants. If you are like the average homebuyer, this list is long. It's time to be honest, yet flexible. Make a list of your wants. Then put them in order of priority. Let's say you want granite countertops. It would be nice if you could have them, but it's probably not a deal buster if you can't get them. That's something you can add down the road. If there are wants you can't add down the road, figure out if they fit into your budget. Other wants include bay windows, an insulated attic, skylights, wood floors, pool, finished basement, and specific type of appliances. These are things that if you can't have right away, you can save to have in the future. Even a finished basement or room remodel can be accomplished down the road if it doesn't fit in your budget right now. As you list your wants, put them in order of importance. This way you'll have a better idea of which home will make you the happiest if you buy it. Again, the value of your real estate agent is priceless during this process. Certain wants don't add value to a home. Let's say you want stainless steel appliances. You shouldn't necessarily pay more for a home because they are included. They don't add value to the home. Going back to the granite countertops, however, they do add value. Curb appeal, hardwood floors, and good schools also add value. These items may be worth a higher home price. If you can afford the higher price, it may be worth it. Don't let cosmetic appeal lure you into paying more for a home. Anything cosmetic you can change down the road. In fact, some cosmetic features bring a home's value down. If it's something that appeals to a very small group, it may actually decrease a home's value. For example, if a homeowner created a circus-themed bedroom for his child, it would not appeal to the couple without children looking for a home. A home inspector can also help you determine a home's value. While the inspector doesn't come up with a fair value for a home, he lets you know what's wrong with the home. Take this into consideration. Certain issues, such as termite damage, mold, or unsafe living conditions, must be fixed. No lender will approve a loan on a home with such issues. However, some things found in an inspection will pass muster. You must determine how to handle the issues. Certain repairs could drag a home's value down, which you would see in the appraisal. 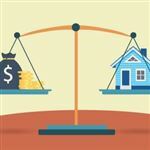 Taking the necessary repairs into consideration can help you determine the home's value to you, not just the dollar value. Chances are, you aren't going to find a home that doesn't need any changes. Finding the home that suits your needs and satisfies a few wants is a victory. Before you start house hunting, make your list of needs and wants and prioritize them. Don't forget you pre-approval letter too. With these items in hand, you'll be the most successful at finding the home that is right for you. Leave a comment about Home Buying Checklist? Share on Facebook "Home Buying Checklist"